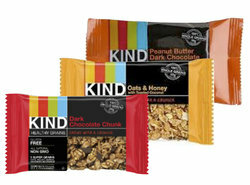 Kind Grain Bars. Kind Grain Bars are made with ingredients you can see and pronounce. These bars are made with the 5 Super Grains and are Gluten Free and Non GMO. We have 3 great flavors to choose from. Only 150 Calories in each 1.2 oz bar. 3 great flavors: Dark Chocolate Chunk, Peanut Butter Dark Chocolate and Oats & Honey with Toasted Coconut. Each 1.2 oz bar is only 150 Calories.